Karl is an excellent instructor, humorous and very knowledgeable! I passed with 30 hours of tuition, with high competence. My driving skills are excellent due to the teaching ability of my instructor. The LDC workbook was very helpful with building my driving knowledge, as well as being an excellent resource for reflection! Karl was super! I made quick progress with him and with the help of the LD system. It helped and guided me as to what skills I needed to make me closer to passing my test. Karl was kind, respectful and thoughtful all throughout the process. He is always so positive towards everything. If I ever did something wrong, he would explain in a detailed, but always understandable way. Overall, an amazing instructor and LDC's workbook is well recommended. 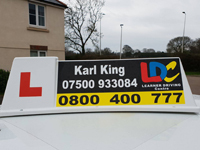 Karl is an excellent driving instructor! He makes you feel relaxed and explains everything with so much patience and calmness. He will always ask about the areas you feel you are struggling with and will help to improve on it as much as he can without any rush. You can never go wrong with choosing him as your driving your instructor!!! 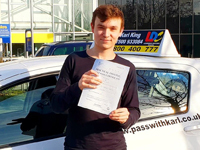 I passed my test first time with Karl, who was extremely friendly and professional throughout my learning. I felt that he made efficient use of my time and was very supportive throughout. I found LDC has a great system of learning, and the LD workbook and DVD were both very helpful and informative. I particularly found the workbook useful with respect to reflecting on my driving. 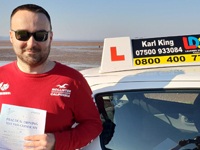 Karl has been a brilliant instructor, taking me through clear step by step instructions when needed to help me learn at a pace that I was comfortable with. He gave me the confidence to grow as an independent driver, able to make appropriate and safe decisions. Throughout each session I was provided with positive feedback and was able to reflect on my progress. 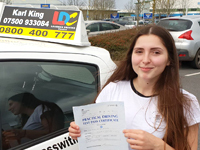 I found the LD workbook and programme very organised with clear targets to aim for and useful information on each area of driving that we approached. The end of chapter quiz for each section also provided useful subjects to talk over with my instructor and ensure my understanding was clear. Karl was excellent throughout my learning experience. He always makes you feel at ease and explains everything in a way which is easy to understand. 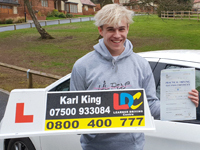 I got a first time pass on both my theory and practical tests and that's thanks to Karl's great way of teaching, and also the LD system workbook which is extremely helpful. 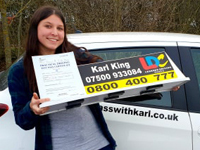 I had excellent service from Karl who helped me to pass with 17 hours tuition. He was always punctual and very helpful. I also found the LD workbook extremely useful and thought it provided excellent value. 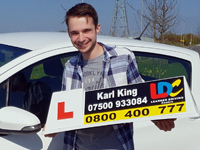 Karl has a very calm and composed teaching style, and also an ideal car for learning in. Overall I'd say brilliant value for money, I would definitely recommend!